Subscribers to your email list are most likely to open, click, forward to a friend, and buy in the first 30-60 days after joining the list. This is the Honeymoon and you need to use it to boost your email results – especially in the 4th quarter holiday shopping season. 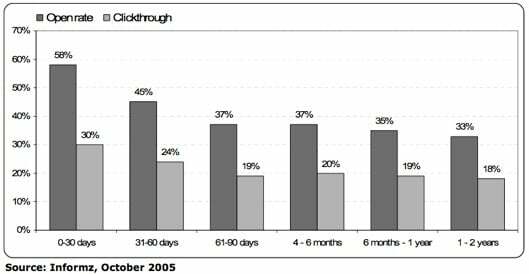 This chart from Marketing Sherpa shows the impact of recency on email results. This is a somewhat dated B2B chart, although I have no doubt whatsoever that the trend holds. If you have more recent data, please leave a comment below. During the Honeymoon, subscribers are flush with excitement about your email program. Possibilities are boundless, as your whole messaging relationship lies in front of them, and surely that relationship will be filled with timely offers and insightful information. While palms are sweaty, and giddiness abounds, you should create a specific and separate Honeymoon Segment for your email program. The Honeymoon segment is anyone who has joined your list in the past 30-60 days. Use 30 days if you plan to mail recipients 3+ times per month, and 60 days for 1-2 sends per month. Treat Honeymooners entirely differently than you do your other subscribers. Mail more frequently, ask them to forward to a friend, use aggressive offers. Essentially, your objective is to maximize the value of the Honeymoon by capitalizing on the short-term excitement that new subscribers have about your program. Because the Honeymoon will end. The excitement will fade in a flurry of email offers, and you’ll begin to quarrel about things that used to seem so trivial – like message frequency, bed making, and spending too much time on your fantasy football team. Note that you can help stave off the end of the Honeymoon by moving as quickly as possible toward truly relevant, hyper-targeted messaging. This is the future of email, but it requires a real commitment to use segmentation to deliver timely and useful messages at all time. Two components of the Honeymoon strategy you absolutely must employ are thank you messages and testing. Send an immediate thank you message to all new subscribers. That thank you should include a meaningful offer (preferably with a time limit) and a request to forward to a friend. Your chances of generating revenue and viral behaviors from your subscribers diminishes with each email received, so try to make it happen in the first 5 minutes a subscriber joins your list. Second, use rigorous testing to maximize the impact of the Honeymoon. The same way you’re engaged in constant testing of your main email program, you need to be testing your Honeymoon segment. From lines. Subject lines. Day of week. Time of day. Layouts. Offers. Note that because your Honeymoon segment will of course be much smaller than your main program, it may take longer than usual to test. Watch your statistical validity, too. Have you used the Honeymoon Segment? Do you think you can adopt it in time for the holidays? Leave a comment with your ideas.